It’s never easy to make a big splash as a small press publisher at a big show like New York Comic Con, but some people seem to have it figured out. 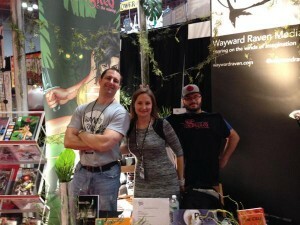 The guys behind Wayward Raven Media started making comics just a few years ago, but now have several titles under their belt, a webcomic, and even more books coming this weekend at NYCC. The group, comprised of Mark Frankel, Joshua L.A. Jones, and Alex Sapountzis, approaches their comic making ventures as a business, one which they seem to be doing okay so far. Read on as we chat with Mark and Alex about comics as a business, Kickstarter, children’s books, and whole lot more. And if you’re at NYCC this weekend, be sure to visit them at Small Press 1266. Leo Johnson: Who are you guys for people who don’t know? That’s always a good way to start. Mark Frankel: To answer your question, we’re Wayward Raven Media. I’m Mark C Frankel, I’m CEO, COO, creator, writer for a lot of our books. And with me is Alex Sapountzis. Alex Sapountzis: I’m the man who needs no introduction because Mark will do it for me. I actually like that Mark has gotten so good at pronouncing my last name that I don’t even have to anymore. Truth is I actually put a pronunciation guide for my name on our website. I’m Alex Sapountizis, artist of Damn Heroes, co-founder, CTO, Minister of Propaganda, and I guess my new title is Creative Director. I do sometimes take on various roles for the company, but we all do. We’re startup-ish or, what’s the word going now? MF: Actually, we’ve been getting some recognition, which is nice. It’s nice we’re actually getting people to come back. People will say, “Hey I think I’ve heard of you guys” and stop and talk to us. MF: Yeah, that was pretty cool. Woo! We have fans. AS: Who will admit it in public! MF: That was really cool. The nice thing is we’ve done enough of these shows that we remember them too, a lot of times. It’s really cool to see people come back and talk to them and hang out. Even just the people who we’ve met on Twitter or Facebook or whatever, and then meeting them in person is fantastic. AS: Especially after the Kickstarter too, coming up to us at cons and telling us they’d backed the project. One guy said it was amazing we’d delivered in a timely fashion. LJ: Yeah, that counts for a lot on Kickstarter, as terrible as it is. I like the you guys mention CEO, CFO, all that because I think new creators don’t really approach comics as a business. I like that you guys are very much looking at it as a business. While you’re obviously having fun, you’re also trying to make it work. Why approach it in such a determined way? MF: This is what I want to do forever. Not only because it’s fun, but because I have a ton of ideas in my head and stuff I want to do. We want to help other people do the same thing. I’m so excited for NYCC I couldn’t even sleep last night. I don’t know if I’m going to get any sleep for the next few nights. Part of it’s stress, part of it’s pure excitement. I love doing this stuff. LJ: This year you guys are debuting three different books of various types. A comic, another issue of your book Horsemen, a children’s book and also a collected edition of a webcomic you’ve been putting out. That’s fairly varied. 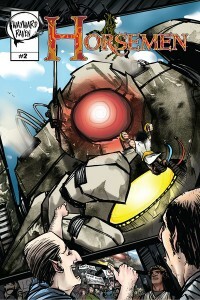 So, let’s start with the comic, the second issue of Horsemen which you started what, a year, a year and a half ago? Maybe two? MF: Yeah, it’s been a while. The first NYCC, we put out two books Horsemen #1 and Ascendant #1. Horsemen we’d been working on for some time. We had a totally different artist starting out, a nice guy just didn’t work out. He wasn’t really doing what we needed him to do so we ended up switching out the artist and contracting Chris Hanchey to do it. At the same time, he also did the pencils and the inks on Ascendant #1. That’s what we went to NYCC 2012 with, those two books. Since then we’ve been doing a lot with Damn Heroes. We actually went to NYCC 2012 with about ten strips of Damn Heroes too. That was kind of where things started. Horsemen #2 has taken a little more time. We actually found a different artist for that, James Biehl. He’s locked in for not just issue 2, which he did a fantastic job, but he’s going to be finishing up the run of issues 3, 4, and 5. I’m really excited about that. I love his style. He’s really done a fantastic job of that one. AS: He’s also going to be at NYCC as well, which is great for people picking it up. MF: Even better than that, the gentleman who did the cover, Matthew Fletcher, will also be there. He’s part of Station Studios and works with Chris Uminga and Chrissie Zullo and those guys. Anyone who goes to NYCC and picks up Horsemen #2 isn’t just getting Josh and my signatures on it, as the writers, but also can get James and Matthew’s signatures on it as well. Can’t beat that. The whole crew for issue 2 is totally different. It took us a little bit of time to get that one out. It has a different feel, not just because of a different team, but book 2 is actually kind of a stand alone book in that it tells a complete story in that one issue. So it’s actually really neat. Once you understand the premise, that they’re fighting Fate and Destiny to preserve free will across the Multiverse, then you can have these little trials. And that’s what issue two is, one Horseman against one of Fate and Destiny’s crew for basically the right to choose free will for an entire planet. LJ: Since it did take a while to get issue 2 done, did that factor into making it into a standalone story as some people may have never read issue 1? MF: Actually we had all five issues written when we started. The problem is that we kind of had to pick and choose what we were going to do. Sometimes some of this stuff was circumstance. What can we pay for? What can we get going? We elected to do a third title, Signed, and we spent some time on that. We have two issues of that out. It’s actually kind of ironic that we did issues one and two of Signed before we got issue 2 of Horsemen out. The nice thing is that we locked down an artist and team to do it now. It’s going to go a lot smoother. In fact, James has said he’s going to have a good turnaround time. He’s chomping at the bit to get the script for issue 3. I wouldn’t be surprised if that was ready to go at the beginning of next year. LJ: Like I said, you’re also debuting a children’s book, Percy. Admittedly, I don’t know about a lot about it, so what’s Percy going to be? MF: Sure, sure. Percy is a sirrush, and I wouldn’t be surprised if you haven’t heard of it, but a sirrush is a mythical creature a bit like a dragon. He’s got a long neck like a dragon, paws like a lion, and talons like an eagle. He happens to be taken from a picture on the Ishtar Gate. LJ: I’m looking at him right now thanks to Wikipedia. MF: There you go! Percy has never met another sirrush before so he goes on a quest to find his people, so to speak. I’ll simply say that it’s an adventure of self-discovery and ideally discovery of others like him. It’s probably ages 5 or 6 to 10, somewhere in that neighborhood. It’s a picture book, but I’d say it’s not your typical board book. It’s probably for 1st, 2nd, 3rd grade, that sort of thing. LJ: You guys have been making comics for several years, obviously, so what caused the jump to a children’s book? MF: It’s actually another project that I’d written some time ago. It was something I wanted to develop. The artist who did it, I met at NYCC a couple of years ago. We eventually negotiated some terms and started to get the book out. Her name is Elke Reva Sudin and she’s a Brooklyn artist, a really, really fantastic artist. She’s done a great job with the book. Alex can probably tell you a bit better because he’s actually seen the book, I’ve just seen the artwork from it. We kind of took our time with this one; it’s just one of those projects that was a little slower to develop because we had so many other irons in the fire. It was written some time ago and just needed someone to bring it to life. One of the reasons we wanted to launch it was that we find on Sundays, kid’s days at a lot of these conventions, we find that we don’t have a lot that’s geared towards kids. So we wanted to expand our horizons and move a little towards that. If this works, we have some other kid’s books we could start developing and we have at least one comic script done geared a little bit younger. For the pre-teen/teen area. I think we want to put some of that stuff out too. 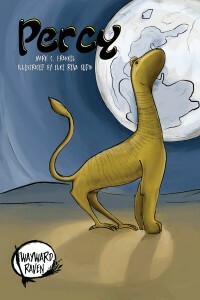 LJ: Your final debut is going to the collected edition of Damn Heroes, which you write and Alex illustrates. Like we’ve talked about, it’s almost two years old at this point. What makes now a good time to collect it all and see if people will read it in print? AS: Because it’s in a book! The funny thing is a lot of time at cons we get people who express interest in Damn Heroes but the only thing for them to pick up at a con is individual strips, and that doesn’t work if you’re new to the property. A lot of times we’ll get people saying they’ll check it out and we’ll get a little interest and buzz there, but now that it’s in a physical format, it’s a good place for people to hop on to. Another thing is that some people like webcomics and will read them once or twice, but then life gets in the way and they’ll miss out or forget where they left off, but a book gives them something they can pick up. It also has a certain collector’s sense to it in that they own it and can revisit it whenever they want. For some people, like those that take the subway, it’s a good offline way of reading something or sharing with friends. From my experience of being an avid reader of webcomics, most of the comics I’ve become passionate about, I’ve read online and then picked up the book or found out about book and then found them online. Books are just easier to consume. Instead of sitting in front of your computer and reading two year’s worth of webcomics, you can grab the book and take it with you somewhere. People have been asking for it, too, so it helps to have it finally arrive. MF: Plus, we want to make lots of money. AS: Yeah! Lot’s of money. Plus, this way, we can sign a Damn Heroes book. We can’t really sign a computer or iPad. LJ: Two years is a really long time to be posting up comics on the void of the internet. It’s got to feel really good to have it in print finally, right? AS: It’s phenomenal. It’s like my baby’s born. Don’t let my wife hear that. LJ: At NYCC you guys are doing various deals and discounts, which I believe you’ve also done at previous cons. MF: Yeah, if you’re willing to pick up a couple books, I want to put them in your hands. I’m not going to not sell you something for want of a dollar. It’s crazy not to. Typically if people bundle stuff, we’ll try to knock something off. Anything we can do to make it easier on somebody’s wallet and gets the book in their hands, we want to do that. AS: We don’t want to take them home with us and we didn’t make them for that reason. We want people to have them and read them. We’ll even throw in artwork so they feel like they’re getting better value. MF: We usually give away one pencilled page to anybody who buys a book. If they want to take it home and burn it after they decide they don’t like, that’s fine. LJ: Children’s books actually do seem like a fairly competitive market to break into. It seems really competitive. MF: I think even more so than comics, everyone has an idea for a children’s book. Everybody has an idea, but a lot of people don’t read comics. At one point in time, though, we were all kids. I think that’s what makes it that much tougher. Exaggerating a little bit, but I’m sure that makes it tougher, even for publishers. Even we do get submissions. One big change that I haven’t mentioned is that we’ve signed an artist by the name of James Emmett and we’ll be publishing his book. That’s purely from an editorial and publishing standpoint. We do get submissions and we do consider them. We are always looking for new talent and new books, so we see some of that too. Sometimes it all aligns and sometimes it doesn’t. We’ve had discussions, and sometimes negotiations don’t work out, but it’s all part of the process. LJ: It’s actually really interesting that you’re moving from self-publishing to accepting submissions and publishing works by others. How is that move so far? MF: It’s actually really cool. I’ve had some great discussions with James. He’s a talented artist and he wrote the book too. It’s neat to work with him and help shape it all. It’s something that we didn’t have, we just had to learn it all on the fly. I’ve been writing for a long time, Alex has been drawing for a long time, Josh has been writing for a long time, and we banged our heads up against the wall for a long time. I think it’s great to be able to guide somebody. LJ: You said James wrote and drew it and all, so you guys are just acting as editors and helping him form the idea a little more cohesively, more or less? MF: Josh and I have done edits on the scripts and helped him work through that. I’d say we probably did three or four edits. He’s done with the pencils and moving on with the inks right now. Josh has been working pretty closely with him on the inks. The next step is we’ll start working for colorists and I have a letterer or two in mind and then it’s getting it out. We may or may not look for cover artists. Once that’s done, it’s going to pretty neat. I’m expecting that to be ready to launch for early next year. LJ: Are you guys going to crowdfund that, as you have past projects? AS: That’s been a sore point. The Signed Kickstarter was the second Kickstarter, and third attempt at crowdfunding. MF: Two out of three were successful, one was not. Frankly, that’s just one of those lessons you learn. We assumed we’d put it up there and people would see it and fund us. We knew it would be work, but our assumption was there would be a lot of people actively looking for projects. It was both a good and hard lesson to learn the first time we did it. The next two times, it was still a lot of work. If I could find ways to raise funds otherwise, I’d do that. MF: Yeah, it’s great thing and it works for certain people, but at the end of the day I’m looking to grow a business. I don’t want to grow one-off Kickstarter campaigns. I would much rather go out, do conventions, get people to know us, talk to people, and I think that’s a better business model in the long run. It takes some time, but that’s fine. I think too often look to Kickstarter almost like it’s a get rich quick scheme when it’s not. It’s a ton of work and may not do anything for you. LJ: I think that’s actually a very good point. I think a lot of people do underestimate the work that goes into Kickstarter. It’s not easy to sell you book, even when you’re put out by Image or Dark Horse. Even less so on the internet where they have no idea who you are. MF: It’s definitely an avenue, it’s just not an avenue I want to depend on. LJ: I generally agree with that. You do see a lot of small press publishers like you guys, and I’m generalizing because I don’t know how many books you sell, and they go to Kickstarter for issue one and then three months later it’s issue two and three months later it’s issue three. While that’s great that they can do that, it also does get to be a bit much sometimes. MF: To some extent, let’s face it, you’re still bugging friends and family. LJ: Yeah, it’s people you know online or reviewed the book or whatever. MF: I totally appreciate the patronage, but at the same time, I don’t want to be pestering. If you want the book, I’m happy to sell it to you. We can have discussions about the book, you can buy it and put it under your tree at Christmas, I’m happy to do all those things. AS: I think our next goal now is probably to get ourselves into stores. Maybe also focus on online sales as well. LJ: You guys have a few books on Comixology Submit now. How has that worked out for you guys? Has it worked well or just been sort of a trickle? Ultimately, it has to get your name out there a little more, right? MF: Yeah, it’s nice. It’s helpful. I think it’s one of those things that builds. You get enough books out there, you’ll eventually start to see some real results. To be perfectly honest, Comixology is still dominated by the big guys. The Submit program is nice. I think they probably have it because it’s going to be a big thing in the future, but I hope they can discover some great books there and have people buy books there. I just don’t know if it’s quite there yet from an indie standpoint. AS: The irony is that you have to be a fairly well-known indie person for your book to get a lot of traction on there. It does work in the sense that people are more likely to buy your book from Comixology than if you’re just selling PDFs online, which is something I’d actually like to ask more people about. LJ: You guys are at NYCC, so where do people need to stop by? MF: We’ll be at Small Press 1266, right by Marvel. We’re super excited about NYCC, so please stop by. Alex, do we have discounts for people? AS: Sure! If you buy anything from our website and use the codeword “DECIMATE” you get 10% off. Anything off the www.waywardraven.com website. If you buy it on the website and come to the booth with some proof of purchase, you can just pick it up right there. If you decide to just show up at the booth, say “bird is the word” or “Leo sent us” and we’ll give you a discount. I think we’ll be doing a buck off any book or print.